The video contains a smattering of everything, which I imagine is the point. There's NPC interaction, weapon modding, traps, vehicles, hacking, and of course plenty of running to the rescue of your fellow soldiers, who by all appearances are incapable of even crossing the street without your help. Not that the bad guys appear to be much brighter. The attack that starts around the five-minute mark isn't exactly a master-class in stealth, but even so, nobody seems to be quite sure about where they should be pointing their guns. I get a certain Far Cry vibe from the video, especially at the end, when the activation of the communication relay seems to signal the end of the mission. 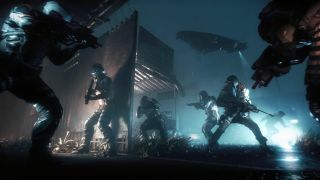 That's an observation, not a complaint—I spent more hours than I like to think about in Far Cry 2, and Blood Dragon was stupid amounts of fun—but I am looking forward to seeing if the new Homefront can deliver that same kind of big, open experience without simply rehashing the same core gameplay elements. Homefront: The Revolution is slated to come out sometime in 2016.